On October 16,1998 Douglas Gordon lost his life on the Tsang Po River in Tibet. Doug was participating in a National Geographic Society sponsored expedition in the Tsang Po Gorge in the eastern Himalaya Mountains. 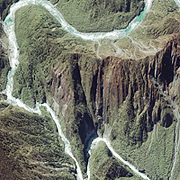 Download River Devil DXpedition Google Earth placemarks [43 kb zip file] for the entire Dxpedition route [Version 1.0 prepared on October 7, 2006]. This is just a preliminary survey. We need to opt for a downstream Dxpedition. So please 'Reverse Order' the points if you feel like! You need to have Google Earth to open the KMZ files. Tibetans believe that the entire Tsangpo Gorge area with the Hidden waterfall, 25,445 feet Namcha Barwa to the South & 23901 feet Gyala Pali to the North are the parts of a living goddess. Namcha Barwa and GyalaPali are her two breasts...the river her spine. In the event of the Earth self-destructing itself, people from the extinct world would sneak away to take refuge in her for their life. The only safe place on earth with waters so pure. If you get a message like 'allow the Signed Java Applet to run'. Do that by clicking 'OK' or 'YES'. It is safe. Click on the map to activate JAVA control. Initially when you see the map, you may not see my station icon (my call-sign). This means I have not yet sent my position beacon. Have patience till your browser receives the beacon. In the meantime you can do other works in your computer. Even if I don't appear, say, after 3-4 minutes, this means my systems are off. That's why ask you to fix up a schedule with me for a demo. When you see my icon with the call-sign on the map, 'CLICK' it. You can see a small text line below the map where my positions and other TEXT MESSAGE appear. APRS® is the Registered Trademark of Bob Bruninga WB4APR US Naval Academy. This page uses Peter Loveall's (AE5PL) javAPRS [javAPRS 2.7b24 © 2006 Pete Loveall AE5PL] to demonstrate ham to non-ham communication (Non-hams can only monitor APRS ham activities using their Internet Browsers) which definitely have utility during any emergency situation, like the proposed River Devil Dxpedition to Tsangpo Gorge. During the demo, VU2MUE feeds the real-time RF (Radio Frequency) data via a KENWOOD radio interfaced to his computer and that data reaches you via the Internet showing his positions & messages on a map (you can in fact track him if you monitor dedicatedly). He uses Late Roger Barker's (G4IDE) UI-VIEW to log-in to Rin Fukuda's (JG1VGX) Tier 2 T2JAPAN APRS server and then the data is internationally distributed from T2JAPAN tier 2 server. 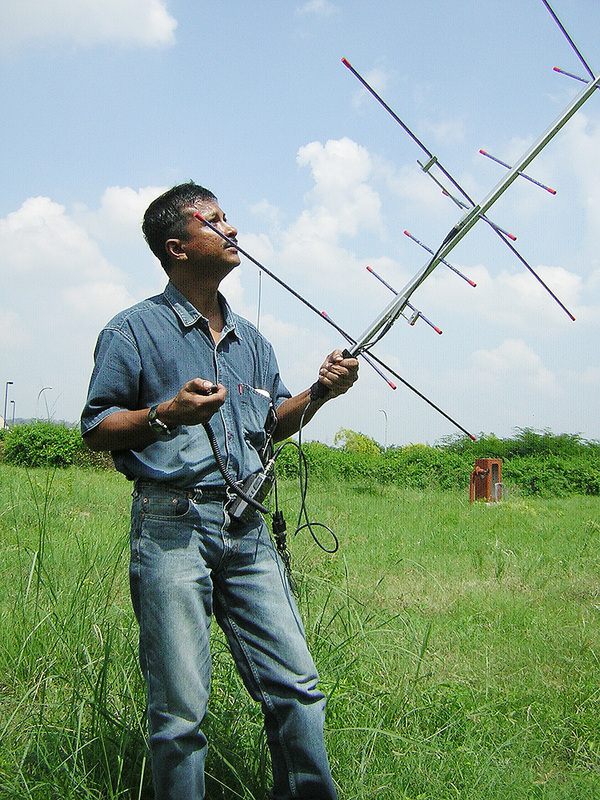 VU2MUE can also remotely text message, i.e. even if he is in his boat at a remote place where there is no Internet connectivity or where there is no cell-phone network, he could 'text message' you! In the map below, you can see his car moving in the streets of Delhi when he is QRV on APRS. 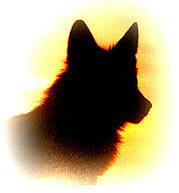 If you want him to give a demo please feel free to contact River Devil at wolfveng@riverdevil.org or call him. River Devil Core Management Team will inform you with the schedule. 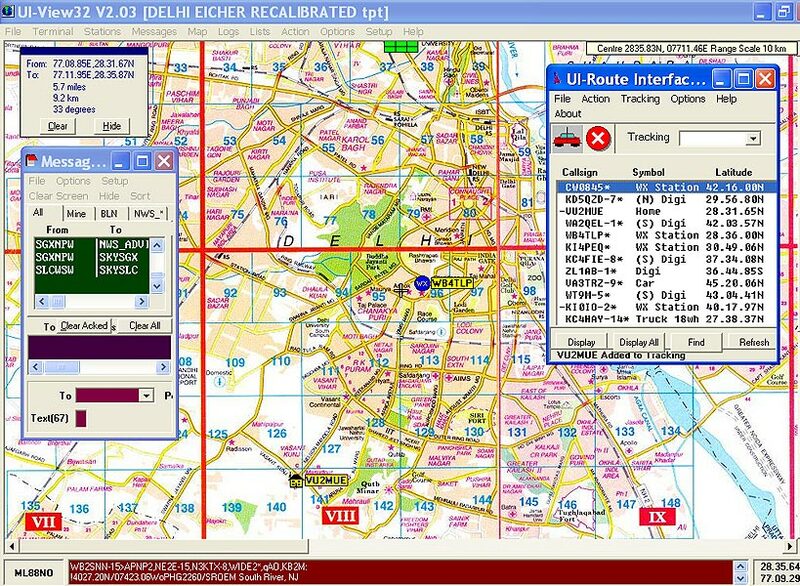 Roger Barker's (G4IDE) UI-VIEW is a popular Windows based APRS application used by hams (radio amateurs licensed by the government) all over the world. UI-VIEW requires a validation from APRS server administrators. Being a ham I always appreciate others also to become hams so that they can also use a beautiful software like UI-VIEW and enjoy the benefits of APRS Technology. Hams in Asia region can contact Art Takashi, JA1OGS for APRS Server validation. Art Takashi, JA1OGS is the official Registrar for Region-3 Asian countries. javAPRS enables the demonstration of Amateur Radio APRS capability to the non-hams who does not have UI-VIEW (or any other APRS applications) installed in his/her computer. The map that appears below is an APRS map accessible by the non hams too. Text messages originated from RF stations can also be monitored by non-hams which has a utility in ham radio emergency communication [press 'M' and the read message at JAVA Console]. Peter Loveall (AE5PL) during a repeater installation. Peter Loveall took over the javAPRS support from Steve Dimse, K4HD. Click here to see the River Devil Expedition metaphorical Inauguration Point (If we start upstream!) which is 73.71 km north east of Dibrugarh or click here to download KMZ file to view in Google Earth. [ MIME type for kmz file download not yet added to my server. Rename the file with KMZ after you download it ]. 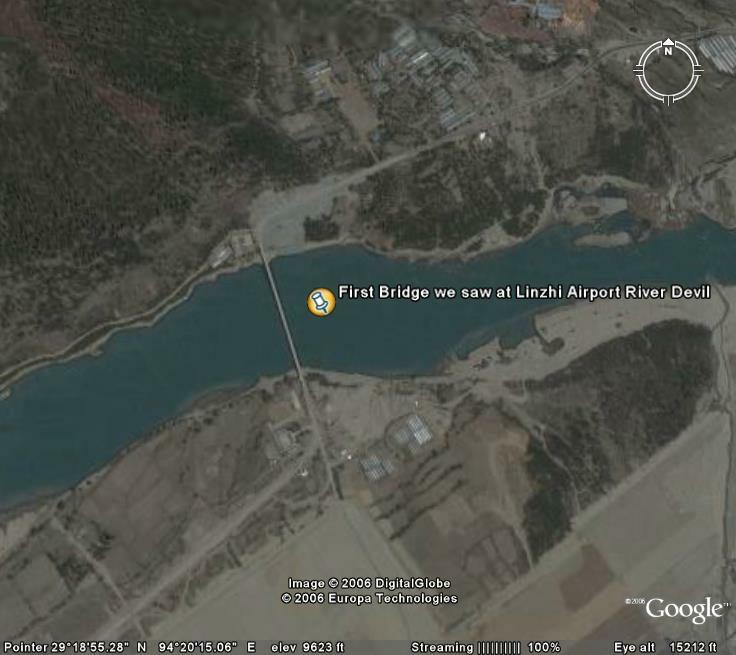 Click here to see the bridge that we saw near Linzhi Airport in TIBET. click here to download the KMZ file to open the placemark in Google Earth. This is the only bridge that we located during the entire course of our expedition. VU2MUE-9 APPEARS ON THE MAP BELOW! Sorry, your browser doesn't do Java! [distance and bearing from base station] in the status bar. Dr. Steve Dimse (K4HG) first introduced the APRS interface to the Internet in 1999. This enabled the feeding of the APRS information originated from mobile ham station to the Internet. In this map you can view the mobile hams at the Vasant Kunj locality of New Delhi. The stations would appear in real-time when they transmit APRS data on 144.800 MHz to reach the VU2MUE APRS gateway. 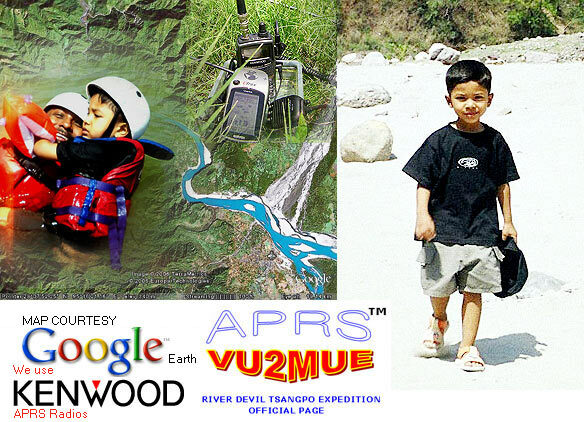 Why VU2MUE contemplates his Expedition? As a child VU2MUE could cross the River Brahmaputra (aka Tsangpo in tibet) many a time with his father to his father's native place. 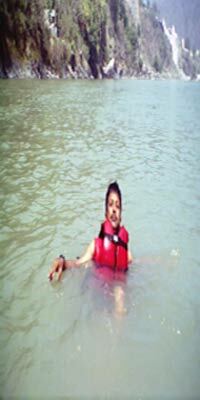 All his river crossings were awestricken experiences. His father used to tell him how he had to swim a furious river to get his education. VU2MUE believes that weirdness wilderness is inbuilt in him. He finds the same weirdness and wilderness in ham radio too. His job involves him in technology demonstration and training. He is a self-taught guy believing in his own passions and living only for his passions. There is no point to 'zoom in' the map [ ALT + CLICK the point you want to 'Zoom In' ] if too many stations don't clutter in a small area. In case if you 'Zoom In' too much and want to restore the map back to its normal size and position [without refreshing the page, because 'refreshing' removes all the stations till they position report the next time ], use the 'Page Up' or 'Page Down' keys' and may be combinations of Left/Right/Up/Down Arrow keys. Once you get a significant portion of the map visible, CTRL + CLICK at the centre of the map. Which is the 'green area marked as NEHRU PLACE. The map should be placed in its normal position within the applet area.